A 2010 file photo of the Lordstown plant making the first-generation Cruze. Ohio TV station WFMJ and local paper The Vindicator say all workers at the plant have been called there for a meeting today. Sources told the TV station that GM plans to close the plant entirely in March 2019. An email to GM reps from Jalopnik was not immediately returned, but we’ll update this post if they get back to us. (Update: In a press release that went live as this post went up, the automaker confirmed the Lordstown plant will close in 2019 along with four other North American facilities. The Lordstown plant has been open since 1966 and currently employs about 1,600 people working one shift, per GM. That’s down quite a bit from the 4,500 workers it had just a few years ago, but remains an important employer in that region. As we’ve reported before, GM is actually doing quite well at the moment, turning better quarterly profits than Wall Street analysts have expected. But it’s also been actively cutting costs, offering buyouts to to 18,000 salaried workers in North America alone and restructuring its entire global operation. This, industry observers and sources have said, is to prepare for huge R&D costs as it shifts toward electrification and autonomy, and hedges against a possible economic downturn in 2019. So it’s not tremendously surprising that Lordstown may be on the chopping block. As I mentioned earlier, it only makes the Cruze on just one shift, at a time when trucks and SUVs dominate the market. Industry analysts are already plotting out possible targets for GM, including its sprawling Lordstown plant in northeastern Ohio. The car produced there is also is built in Mexico. The once-bustling factory already has lost two of its three shifts and 3,000 union jobs since the beginning of last year. 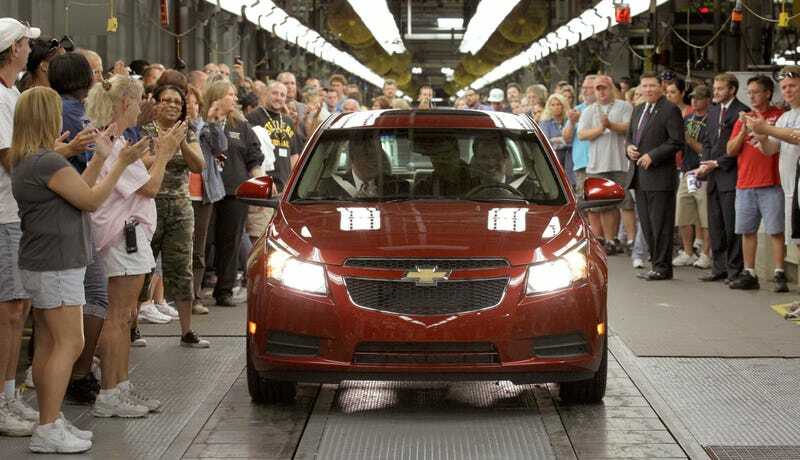 But moving that car, the Chevrolet Cruze, south of the border brings the risk of provoking a backlash from President Donald Trump. And GM also isn’t sure whether he’ll make good on threats to impose 25 percent tariffs on vehicles imported from Canada and Mexico. The plant has also faced turmoil before. It faced closure back in 1998 when it was making the Chevrolet Cavalier and Pontiac Sunfire (and had four times as many employees) but local leaders convinced GM to keep it open.